It’s not uncommon for a question or two involving three-dimensional shapes to appear on the SAT. Luckily, most of the time these questions either deal directly with the simple properties of three-dimensional shapes (like surface area and volume), or are just 2-D questions in disguise. It’s pretty rare to come across a truly difficult 3-D question — but you know I’m gonna give you some in this post because I care about you so. 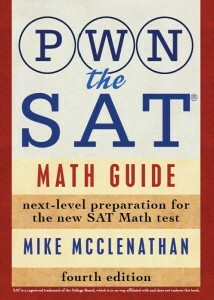 Generally speaking, the SAT will give you every volume formula that you need, either in the beginning of the section (rectangular solid — V = lwh; right circular cylinder — V = πr2h) or in the question itself in the (exceedingly) rare case where you’ll have to deal with the volume of a different kind of solid. It’s worth mentioning, though, that the volume of any right prism* can be calculated by finding the area of its base, and multiplying that by its height. You almost definitely won’t need this particular formula on the SAT, but it’s nice to know how to find the volume of a right prism in general: just find the area of the base, and multiply it by the height. If the volume of the cube in the figure above is 27, what is the length of AF? So far, so good, right? 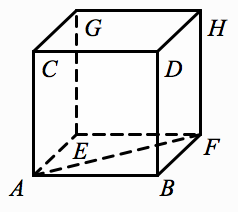 Now it’s time to do the thing that you’re going to find yourself doing for almost every single 3-D question you come across: work with one piece of the 3-D figure in 2-D. The diagonal of a square is the hypotenuse of an isosceles right triangle, so we can actually skip the Pythagorean Theorem here since we’re so attuned to special right triangles. AF = 3√2. That’s choice (B). If the volume of a cube is 8s3, which of the following is NOT a value of s for which the value of the surface area of the cube is greater than the value of the volume of the cube? The answer must be (E), the one choice for which the inequality is NOT true. * Right circular cylinders and rectangular solids are both special cases of right prisms — a right prism is any prism whose top lines up directly above its bottom. You’re right that it’s tough, but I don’t think it’s outside of the realm of possibility. See #19 on page 401 of the Blue Book for another 3-D question that actually requires a bit of 3-D reasoning and a similar number of steps. That one provides a diagram, but I actually think it’s a bit tougher than my #20. Thank you for the references, I will look them up tonight. I think the problem would be easier if you gave the volume and asked for the radius. Going the other way around seems to require more steps and more advanced reasoning. OTOH, I may have just gone the long way without realizing it. pg 401 took me 3 minutes including rationalizing the denominator and then realizing the answer choice wasn’t there and having to go back and un-rationalize the denominator to find the answer (what’s up with that? very poor form). Figure not drawn to scale and the whole e=m thing are only there to obfuscate but it consumes time to digest these things. Great example of College Board using tricks that have nothing to do with math. What is up with question #20 on that page?? That is difficulty 2 at the most, but it is listed as a 5. Thanks again for the great problems! Hmm…I’m not sure how you solved mine, but I think the tricky step exists in both directions: recognizing that the diameter of the sphere connects two opposite corners of the cube, and then determining the relationship between that diagonal and the length of the cube’s side. What I was trying to get at with the question is that often, on the hardest 3-D questions, what you’re really doing is doubling up on the Pythagorean Theorem — using it once in the plane of a solid’s side, and then using the value found that way to form another right triangle that cuts through the solid. Not too bad (although certainly not trivial) once you know to look for it, but brutal the first time you encounter it. I wonder, if you had encountered those two BB questions before mine, if mine still would have taken 5 mins. As for #20 on pg 401, I agree. Pretty easy stuff. It’s important to remember that some questions make it to #20 because a lot of kids get them wrong, not because they’re hard. Symbol Functions are another great example of this. Students are notoriously imprecise when it comes to the word “percent.” The questions is easy if you translate “k percent” to mean “k/100,” but I’ve seen countless kids get stymied by this kind of question because they’ve become so accustomed to “moving the decimal point” that they forget WHY that is done, and they don’t know how to move a decimal point on a variable. You may be right, the way I did your problem was kinda weird. I set the side edge to 4 (arbitrarily), then realized the diagonal of the face would be 4 sqrt2 and the cube diagonal would be 4 sqrt3. I then tested another edge size to make sure the x : x sqrt2 : x sqrt3 held. Then I solved for x by setting the third formula equal to 8. That whole thing with setting the edge equal to 4 and testing the relationship between the legs is not necessary when the question is asked the other way around because you are starting out knowing the edge. I now see how I could have solved for x directly without the abstraction but this was not obvious at the time. the distance from the centre of a face to the corner = x/√2″ part… Thanks. It’s hard to explain this one without diagrams, and it’s impossible to draw diagrams in the comments, so I’m going to attach an image of the solution I put in my book for this question. If this doesn’t help, let me know, and I’ll try to clarify the parts that are confusing. I lost you after the 45 45 90 triangle was shown. I’m not sure how it becomes 8 Sroot2 and S? 8, S, and S√2 are the sides of the right triangle that’s drawn in dotted lines in the first drawing. Does that help? Oh! I see that now. We were trying to find the diagonal of the square. I was about to say I couldn’t see the 30 60 90, but I can’t argue with the math. Thank you very much! Can you please explain number 18? Like so many 3-D questions, this one is really a right triangle question. First, picture the two ants as far apart as they can possibly be from each other. They need to be on opposite rims of the cylinder, first of all. They also need to be on opposite sides of the tube…like if it’s held horizontally then one is all the way top right, and the other is all the way bottom left. Check out the picture below, since I’m clearly having a hard time explaining this with only words. Wouldn’t you account for the curve as well? Like when measuring distance on the earth, you don’t draw a line thru it from the US to china but you take a portion of its circumference. Wouldn’t the same apply here as well? No. Here, you just cut right through. It’s a cardboard tube! You’re not burrowing through earth. I’ve been staring at 19 for about 45 minutes, and I know it’s got to be something much simpler than the paths I’ve tried. I really need to work on the “be nimble” philosophy. Anyway, can you put me in the right direction? Another hint: since d appears in 3 of the terms, it must be the height. 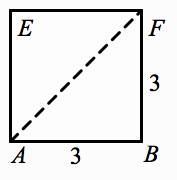 So a, b, and c, are the sides of the triangular bases. I finally got it! I hope I used a reliable method. I ended up looking at the 30-60-90 special right triangle to get the answer. This may seem like a silly question and I’m sure I just need to brush up on my basic geometry, but how was I supposed to know there was a 90 degree angle in there? Visually it doesn’t seem like any of the sides form a right angle to me. Do right prisms always have right angles somewhere in their bases? Awesome! The way you figure out it’s a 90º angle is that only a right triangle’s area is half of the product of two of its sides. Any other triangle, you’d need another constant in the expression. There’d be the sides of the triangle, and then the “height” of it. Since you ONLY have the sides of the triangle in an expression for its area, it must be a right triangle. I didnt get question no. 19. Can you pleasee explain ? This is a pretty tough problem. The first step is to realize that the surface area should be base + base + side + side + side, but the expression you’re given, ab + ad + bd + cd, only has 4 terms. So there’s something funny going on here. Since 3 terms contain a d, you can conclude that d is your height—it’s multiplied by each side of the base to create the three vertical sides. Now you’re left with the fact that ab has to represent both the top and bottom face. 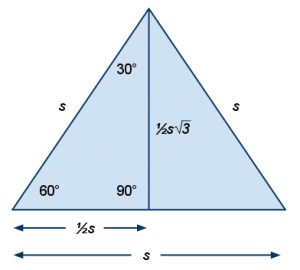 Remember that the area of a triangle is ½bh, and you’ve got 2 congruent triangles’ areas represented by ab. That must mean each of them is ½ab, making the base a right triangle with legs a and b. So the hypotenuse, which is what we want, must be c.
For the longest time i was wondering why it can’t be side D and then i realized its asking for a side of the prism’s base. To improve from 580 to 650, concentrate on getting all the easy and medium difficulty questions right. You can score a 650 without answering many of the hard questions. For more information, see this post.